Fourth Project Meeting, 9th to 10th May 2012, Maison Française, Oxford. Wednesday 10th May, Internal Programme including an assessment of progress made by the project, and any required revisions to the description of work. Agora project members met in order to discuss progress made on the project during its first year. Practical sessions on the Open Journal System for the two new journals, the ‘Agorisation’ of metadata, and the new Muruca platforms. Fittingly, the meeting was held in the Research Institute of the Brenner Archives, at the University of Innsbruck, where project members were also treated to a guided tour of the Archives, by Agora project member, Joseph Wang. Planning the archives of the digital age, surrounded by an archive of a more material form. Our meeting table with sleeping laptops, as we turned our attention to the material archive Joseph was showing us (below). Members of the AGORA project consortium met in Lecce from 4th to 8th July, for a technical meeting and a project meeting. On the agenda were a discussion of the Open Journal System, a review of the Talia content instances, and roundtables on the experiments. We also had overviews of the experiment evaluation strategy and of the content preparation guidelines. Agora content providers met in Pisa on March 31 to April 1 to discuss metadata coordination. Discussion focussed on the “Open Journal System” (workflow, metadata, markup) and on the requirements for data conversion between the partners. 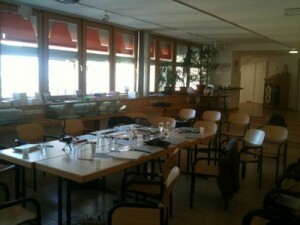 The AGORA Kick-off meeting took place in Vienna on February 14th and 15th, 2011.